Every now and then, we do a post that isn't food related at all, but rather related to something that has a special place in our hearts, and this is one of those posts. It seems that every cause these days has a ribbon, a color, and a month. I don’t think you realize the significance of any of it until you wear a ribbon for someone that you love. Anyone who has watched someone fight breast cancer will tell you that the wearing a pink ribbon really does mean something special, and the people who were the first ones to wear them many years ago will tell you that it has for sure raised awareness of the issue of breast cancer. So why is blue important to us? 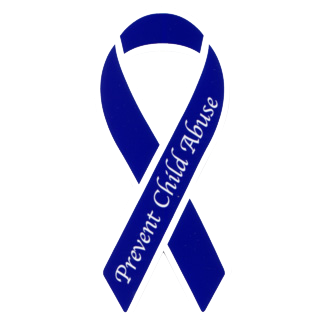 April is Nation Child Abuse Prevention and Awareness month and in our careers we have dealt with cases of abuse that we will never forget. We have testified in court, reported abuse that made a life or death difference, and hugged fragile little souls that have been battered beyond belief. There is one more reason that makes it even more important, one that I almost hesitate to mention. It is almost one of those things that is too personal and once you say it you can never take it back. Like when you squeeze out too much toothpaste, you can never put it back. Our personal story of child abuse in our family is my daughter. Five years ago we began the process of adopting her from foster care. She had spent almost five years there and thankfully, she is one of success stories. We write about her here frequently, and we sincerely hope that seeing how successful she has been will inspire other people to consider adoption. She is bright , beautiful, and I can’t imagine life without her. She has suffered loss and heartache that no child should ever have to endure. But, I don’t want to make her the poster child for child abuse. No child should be. Ever. I want to tell you how YOU can make a difference. Really there are lots of ways. I want to begin with a story of another child. Even after I adopted I learned that I wasn’t doing my part in my community to fight child abuse. I have a friend who also adopted a child from foster care, an adorable little girl. (We often say we got the two most beautiful ever) Her daughter’s case carried on even after adoption. There was a criminal sexual abuse case that went to court. Horrors! Did I go to court for her? Did I set there and let her know that she had my support? Did I go to her house the day before her daughter had to testify and pray with her? Did her church? No. I did none of that. I texted. How lame. Do you know who DID do all of those things and more? A motorcycle gang. Yes, a group of people that are sometimes looked down upon took on the duties that her friends and church should have been doing. They attended court each day. Take that SEXUAL PREDATOR! This taught me so much. BACA (Bikers Against Child Abuse) are people who know how to fight child abuse. Here are some things that they do. Know what is considered abuse and report it if you see it. Pray for the children, parents, foster parents, caseworkers, and judges. Be visible in the community that Child Abuse will not be tolerated. Wear Blue on the day set aside for Go Blue day in your area. Repost this or link to it. Spread the word. I had taught many years before I was immersed in the world of foster care and adoption. I thought I knew quite a bit about it, having been involved in several cases. I was wrong. I knew nothing! I didn’t know that neglect accounts for 60% of cases reported AND that severe neglect can rewire a child’s brain. I didn’t know that almost all sexual abuse victims know their assailant, often a family member or close friend. I didn’t know that with work, children can and do recover and have the potential that all others have. As I said before, I don't want people to look at my child and think of her past. She is more than that and she has already began working to help other children who have been victims of abuse. She has overcome. The ones who can't? The almost four children per day who die in the US due to abuse or neglect.